At that time, Jesus went into a city called Nain; and many of His disciples went with Him, and much people. Now when He came nigh to the gate of the city, behold, there was a dead man carried out, the only son of his mother, and she was a widow: and much people of the city was with her. And when the Lord saw her, He had compassion on her, and said unto her, “Weep not.” And He came and touched the bier: and they that bare him stood still. And He said, “Young man, I say unto thee, arise.” And he that was dead sat up, and began to speak. And He delivered him to his mother. And there came a fear on all: and they glorified God, saying that “A great prophet is risen up among us,” and that “God hath visited His people” (Luke 7:11-16). 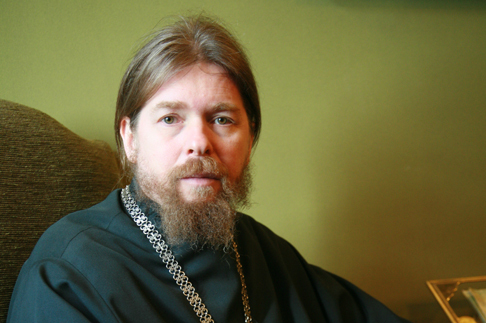 Three days ago the mother of Yuri, our recently departed colleague, came to the monastery. You all probably remember him. We pray for him at the Liturgy daily. Yuri was fifty years old and died suddenly. His mother, weeping, came up to me and uttered: “Why did your Lord take my son? He won’t ever return. How can I live now? How can I believe now?” The mother’s grief was terrible. I told her that her son is alive in God and that, if she will believe in Christ and the promises He made to people, that she would see her son in the new life in the Heavenly Kingdom. But due to the inconsolable grief of this old lady who has been left alone in the world – and is still far from the Church – she was not yet able to hear me. In today’s Gospel reading we heard the narrative of how, in the city of Nain, the Lord returned to life the departed son of a widow. The greatest joy and the greatest beneficence! But why did He, the Almighty, save only this child? We understand how many of the most fervent prayers of mothers for their sick and dying children have gone, as it were, unheard! Many of these disconsolate mothers could have repeated the words of the Prophet Jeremiah, addressed to the Lord: Why is my pain perpetual, and my wound incurable, which refuseth to be healed? wilt Thou be altogether unto me as a liar, and as waters that fail (Jeremiah 15:18). Why was God’s power accomplished in this special way only then, in those unique and inimitable days long ago – two thousand years ago – when God, our Lord Jesus Christ, was incarnate and walked the earth? And although many of us are ready to bear witness to occurrences of God’s power and providence in our own days and in our own lives, we know that God’s almighty power – of which we are all so in need – only occasionally breaks through into our world, which suffers from sin, injustice, and death. If these miracles and signs of God’s omnipotence did not visit us, then faith would most likely be completely extinguished in people. But still, what is the meaning of this mysterious raising of the boy of Nain, apart from the fact that the Lord simply had mercy on the suffering of a poor mother? Our Lord and God Jesus Christ, Whom the ancient Prophets foretold, was Himself the greatest of Prophets, heralding to people the future, the Eternal Life that is so mysterious to us. In His first coming two thousand years ago, Christ revealed that which would be fully disclosed to the world after His Second and Glorious Coming. The raising of the widow’s son, which we commemorate today, was not only an act of God’s mercy, but was nothing other than a prophecy. Our Lord Jesus Christ’s entire life, and equally His every deed and word, was a wondrous prophecy about the Heavenly Kingdom He proclaimed. It is given unto you – the Lord said unto His disciples – to know the mysteries of the kingdom of heaven (Matthew 13:11). And He Himself generously reveals these mysteries to us. In this marvelous, coming Kingdom – the Lord prophecies – no one will ever be hungry. Everyone will be filled with Divine food: His Body and Blood. All sickness, sorrow, and sighing will be left in the past. 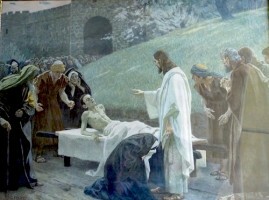 All sickness will be healed, just as the paralytic, the man born blind, and the man with the withered arm were prophetically healed. All sorrow will be comforted, even that as desperate as that of the widow of Nain. 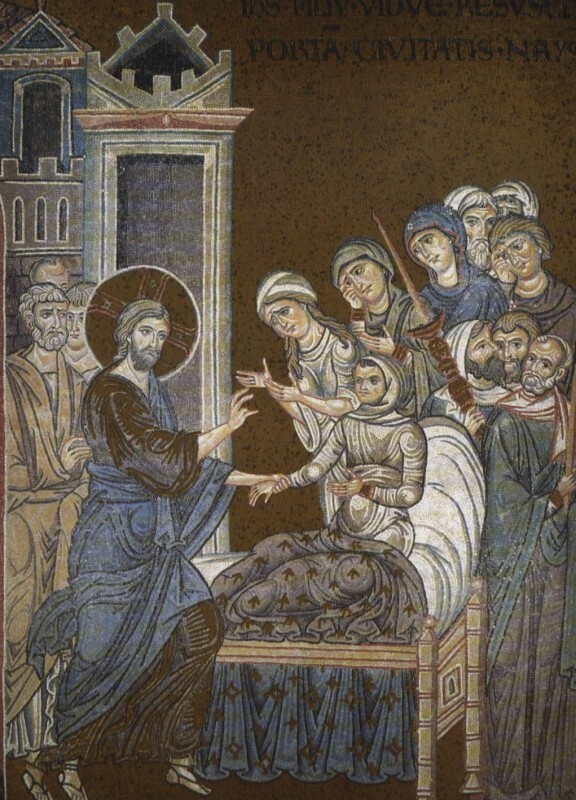 Death itself will be defeated, just as it was defeated by the Savior for the child about whom we heard today; for the girl, the daughter of Jairus, the ruler of the synagogue; and for Lazarus, who was four days in the tomb and had already begun to decay. All of this is the prophecy of Jesus Christ about the raising of us all. And, of course, the greatest prophecy – the raising to new life of the entire world – was Christ’s victory over death in His light-bearing Resurrection. In the Heavenly Kingdom answers will be given to our most difficult questions of the universe, just the soul of Nicodemus, which hungered and thirsted for higher truths, was prophetically filled. On the threshold of the Heavenly Kingdom all doubts will be dispelled, as were those of the Apostle Thomas, when he saw his risen Teacher and cried out: My Lord and my God! (John 20:28). In this eternal Kingdom of good, the triumph of justice – so desired by every pure human soul – will be accomplished. All evil, lies, and the devil himself will be cast out from the world, which will become a temple of God, just as Christ prophetically cast out those who were buying and selling from the Temple in Jerusalem. In Christ’s Kingdom – into which He is leading us all – mundane, everyday life will be transformed into an unexpected, wondrous feast, just as fresh water was prophetically transformed by the Lord into the finest wine in Cana of Galilee. Every disciple of Jesus Christ will have the greatest happiness of full freedom, which can only occur when God is next to man. The Apostles had such happiness when they followed their God and Teacher through the sown fields of Galilee, and everything in this world was possible for them. But in the meantime you and I will again and again, in moments of trial and in the depths of our souls of little faith cry out to God like Jeremiah, who was a great prophet, but still a man like us: wilt Thou be altogether unto me as a liar, and as waters that fail? (Jeremiah 15:18). Therefore thus said the Lord, If thou return, then will I bring thee again, and thou shalt stand before Me… for I am with thee to save thee and to deliver thee, saith the Lord. And I will deliver thee out of the hand of the wicked, and I will redeem thee out of the hand of the terrible (Jeremiah 15:19-21).